So yesterday we finally had some snow. At about 5pm it fell for all of about 15 minutes but it was a proper mini blizzard and it even settled on the ground for while. As predicted my son was super excited and I couldn't drag him away from the window. He was annoyed I wouldn't let him go outside and also questioned whether snow meant Father Christmas was coming. But it's all gone now and no more is forecast. I am therefore hoping an early spring is round the corner but I have a feeling my hopes will be dashed. This is a stunning snowy photo and it doesn't actually make me feel cold. That beautiful sunlight looks almost summery. 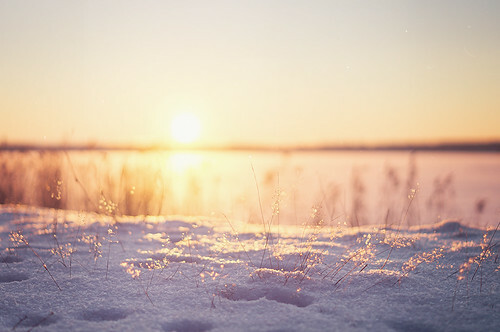 In fact if the picture hadn't been called 'Snow Glow' I would have questioned whether that was actually a sandy beach. Happy weekend everyone. Enjoy the snow... if you have it!